The Arthur Meighen Statue in Lind Park, Church St. was spray-painted with graffiti for the second time this past week. Arthur Meighen was the 9th Prime Minister of Canada and attended St Marys Collegiate Institute when it was located at the Arthur Meighen P.S. 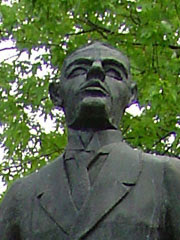 In 1968 Montreal sculptor Marcel Braitstein was commissioned to produce the statue to be erected in Ottawa. It remained in a warehouse for almost 20 years until it was brought to St Marys in 1987. The paint has now been removed and to discourage further spray-painting the surrounding trees, the most attractive feature of the statue, will be cut back. 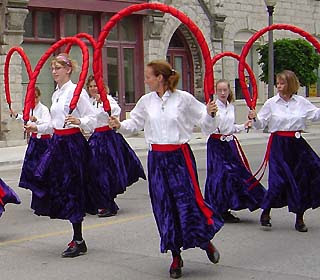 Morris dance teams from the United States and Canada, including the local St Marys Quarry Girls, will be performing this Sunday, June 10 from 10 am to noon on Water Street outside of Damen's Restaurant. Each team will be dance individually and there will also be a massed dance. 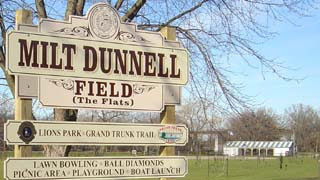 From 1:30 pm until 4 pm the dancers will be performing at in downtown Stratford. The final dance exhibition by the teams will be outside the Stratford Festival Theatre doors from 4:30pm to 5pm. 26 vendors will be at the free St Marys Garden Fair to be held tomorrow at the Flats from 8:30am until 1:00pm. It is the 10th year the St Marys Horticultural Society is holding the fair. 15 per cent of sales will go to the Society which plants and maintains 12 flower beds around town.